This recipe comes from Nigella’s column in the New York Times, “At My Table”. I’ve only just discovered that a lovely woman from the nigella.com forum has posted up loads of Nigella’s recipes and columns, which I’ve been voraciously reading through. Many of these recipes reappear in Feast, but there are also lots of ones I haven’t seen before. Almost as good as discovering a new Nigella book! But I’m actually very happy that I didn’t discover this archive of recipes before I got Feast. Otherwise, I’d have been well disappointed with Feast itself. Not only are some recipes repeated, but also many of the wordy Nigella descriptions (which I absolutely love) are taken word for word from “At My Table” and transplanted into Feast. Anyway, enough of these minor complaints. I made this for lunch on Saturday. 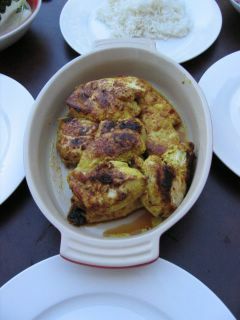 The chicken is marinated in yogurt, spices and lime juice, left to marinate for four hours and grilled. For ease, I marinated it the night before, whilst having a late-night cup of tea with my family. Mum: It smells really authentic! 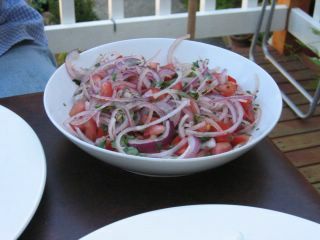 It is served with a red onion relish – thinly sliced red onions, chilli flakes, lemon juice, coriander and a tomato. The addition of lemon juice takes the edge off the strong onion taste, so you can eat it, and still open your mouth in public afterwards. This was especially a concern for my father, as he was going out for a singing gig that night. I served it with fragrant basmati rice for my parents, and salad leaves for me. But in truth, you need nothing more than the delicious relish. Another fantastic, low carb Indian meal!